Markus Maskuniitty’s debut recording together with the Royal Stockholm Philharmonic Orchestra together with its chief conductor Sakari Oramo, showcases four concertante works for horn and orchestra covering a period of one hundred years (from 1849 to 1951). Robert Schumann described the horn as the ‘soul of the orchestra’ and he had a profound affinity with the instrument. 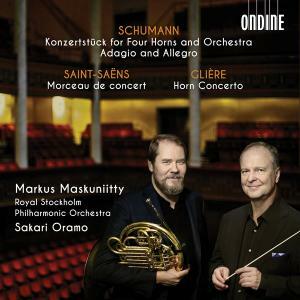 The most substantial of Schumann’s works featuring the horn is the Konzertstück for four horns and orchestra, Op. 86. Schumann considered the work as one of his best achievements as a composer. During 1849, Schumann wrote a total of three works featuring the valve horn. The Adagio and Allegro for horn and piano, Op. 70 may be considered a precursor to the Konzertstück and is a central work in the Romantic horn repertoire. This recording includes an orchestration by conductor Ernest Ansermet. Camille Saint-Saëns wrote a large number of concertante works, including a masterfully crafted concertpiece for horn and orchestra in 1887. It highlights Saint-Saëns’s mature skills in orchestral writing and as a composer of solo instrumental music. Final piece of the recording is Reinhold Glière’s Horn Concerto. Completed in 1951, it was the composer’s swansong. In this romantic concerto one can hear echoes of Tchaikovsky and other great masters of Russian classical music.